We asked custom builders what they’d change if they were launching their business today. — Keith Smith, Keith Smith Construction, Cantonment, Fla.
"It just makes cash flow so much easier to manage," Keith Smith says. This was one of the most oft-repeated suggestions for a start-up, obviously a lesson learned by many builders. One even suggested that if you don't have $500,000 in the bank, find something else to do. "Cash is king right now," says Smith, "especially when you're trying to get a business started." Lots of disagreement on this one, but it's hard to argue with Chris Gardner's logic when he laments that he built his first two houses for practice when he started in the custom market last year. "I wanted the business, so I low-balled my bid," he admits. "Materials costs went crazy, and I just had to eat those costs." Of course, Gardner admits he got his next house because he built the first one. That's not unusual, many more experienced builders noted. Some suggested that building a couple of trophy houses that don't turn a profit is the price of entry into the custom marketplace. But Gardner says he now does everything on cost-plus contracts and he's up to six houses a year. There's almost universal agreement that new builders ought to stay away from buying lots, building specs and signing on the dotted line at the bank. "I was a good case history for this bit of wisdom when I started in 1993," Stephen Hann says. "I ran things out of my house, had no overhead, did the books at night and made phenomenal margins for four years." But then he started to grow and dropped his guard. "Leverage got me in a lot of trouble," he says. "If you just set up a line of credit, use it only to establish your credit, then pay it off, it would be a good thing. But buying lots and building specs is a bad idea." Count Jim Sattler among those who think new custom builders ought not expect to make much money their first few years in business. "If I were starting over, I think I'd try to do on purpose what I managed to do through accidental good fortune — set myself apart by building a portfolio of acclaimed houses," he says. Sattler recounts how he found his way into contact with Colorado architect Jerry Gloss, who designed a house that Sattler built in Minneapolis for a Street of Dreams in 1990. "Somehow, that house ended up in a three-page feature in Professional Builder. I still have the framed story in my office. It played a big role in building my business, even though I didn't make any money on it, given all the travel it required to Minneapolis." Sattler and Gloss remain frequent collaborators. "That's why I suggest young builders kiss up to a really good architect and try to talk him into giving you a chance to build one of his designs," Sattler offers. "To be successful, you really need to get some trophy houses on your belt, and I don't think it matters if they make money." — Ross Savoie, Savoie Construction, Slidell, La. "Our company is 30 years old," Ross Savoie says. "I've been in the business for 15 years. We used to do 15 to 20 houses a year; now it's five." Be cautious with growth, he warns. "I wouldn't hire anybody for a while, until you get established." Savoie admits reaping a whirlwind of inflated overhead and inventory homes just before Hurricane Katrina hit. "Then we did 200 renovations for past customers after the hurricane," he says. Now, remodeling is the biggest part of the business. "It's paying the bills," he says, "but it's different. Markups have to be greater. One bad deal teaches you that. We've always done major renovations, but now remodeling is what keeps us busy." — Charles Miller, Miller Custom Homes, Virginia Beach, Va.
Green building specialist Chuck Miller has just experienced the explosive power of a major Web site upgrade. "Our hits went from 350 a month on our old site to 3,500 a month on the new one: www.millercustomhomesonline.com," he says. For a small custom builder with only two employees, this is heady stuff, but it also points out that Web site visitors can't necessarily tell who is big and who is small just by visiting a site. You are what your Web site paints you to be. Think of the possibilities. For custom builders, especially those with strong portfolios of homes and photography, there's certainly an opportunity to repeat Miller's success. — Randy Rinehart, Rinehart Custom Homes, Charlottesville, Va.
Randy Rinehart suggests new custom builders ought to see a therapist before they try launching a new business in the current market. But just as many thought this is as good a time to enter the business as a bad one. Still, Rinehart suggests what new builders need most is education, and the local home builders association is a great place to start — as well as pick the brains of a lot of more experienced builders. "Sign up for every course you can find through the HBA on the administrative and sales sides of the business," he says. "Never stop learning, and never think you've got it figured out, because that's when you're set up for a fall. Too many young builders have big egos and think they've got it down pat." He — and several others — endorsed the national association's Builder 20 Clubs as a great way to learn from more experienced custom builders. — Jay Grant, Grant Homes, Morristown, N.J.
Jay Grant suggests even experienced builders would have trouble breaking into his market in the Northeast today. "You'd have to work for nothing," he opines. 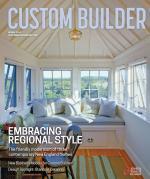 "The best advice would be to partner with an established custom builder in a high-end remodeling business. That way, you'd develop a portfolio of work, make contacts and learn the systems, bookkeeping and detailed contracting sides of the business." Build a company around a succession of smaller jobs, he suggests, then work your way up to building fully custom homes. Steve Baudo, who says his custom building business is better than ever, says he wouldn't do anything differently if he were starting over today. In fact, he believes new builders now ought to do what he did years ago: serve an apprenticeship in production building before going into the custom market to learn how to use systems and control processes. "What they would learn is how to do 12-page, line item price quotes," he says, "right down to the hinges on the doors." Baudo says he is able to quote fixed-price bids at cost plus 11 percent margin when competitors are quoting cost plus 15 percent. "Would you rather have 15 percent of nothing or 11 percent of something? "There are no surprises for me," he says, and credits what he learned by slowly moving up the ladder from entry-level production building to move-up to luxury before finally jumping into custom building. "My bids are accurate," he says, "even though the spec level is higher than most competitors." — Michael Fratatoni, Desert Sky Development, Scottsdale, Ariz.
We can debate whether it makes sense for a new custom builder to try building primary homes in a major city and vacation homes two hours away. Nevertheless, that's what Michael Fratatoni says he would have done, much sooner than he actually did. "I diversified about a year ago," he says, "and it's going so well that I'm kicking myself that I didn't do it before." Fratatoni started a subsidiary, Mountain Sky Development, to build second homes in the mountains of northern Arizona. He's now able to approach his Scottsdale clients and ask, "Don't you want to have a mountain retreat to get away from the desert in the summer?" He's now building a $2 million mountain cabin and a $5 million desert home for one client. It's not a bad idea for builders in any city that has a vacation resort area within a two- or three-hour drive. But perhaps think twice if you're a fledgling custom builder without any clients, trying to build a reputation. At first, Ed Wiesner jokes that all he'd do differently is buy a bigger gun. "I do build in Texas, you know!" But then he turns serious and says, "I'd watch my staffing levels a lot closer and apply the payback ratio." If you're targeting a 20 percent gross margin, Wiesner says, every employee should generate five times his salary in gross revenue. "If you're paying somebody $50,000 a year, you have to make $250,000 in additional gross revenue to justify the hire," he asserts. "I made the mistake of bringing somebody on who didn't meet the payback ratio. That's what you have to watch." Janet Enge says if she could do one thing differently, it would be to spend more time studying business management. "After all," she says, "80 percent of running a business is running a business, not building houses." True words, especially because most custom builders know a lot more about building houses than running a business. It only makes sense to spend the most time working to improve a weakness. Opportunities abound to make that happen, many right in these pages. Comments on: "12 Things Custom Builders Would Do Differently"